The Intertur Hotel Hawaii Ibiza is a modern all-inclusive hotel set on a small peninsula between two sandy beaches, 1.5 kilometres from the lively centre of San Antonio. Sun-worshippers can enjoy relaxing days by the circular pool with the sights and sounds of the sea just beyond the terrace, and there is direct access to the sandy beach for a dip in the Mediterranean. Guests can relax in the bar, play pool in the games room, catch up on the news in the TV room, or unwind with a cool drink on the terrace. 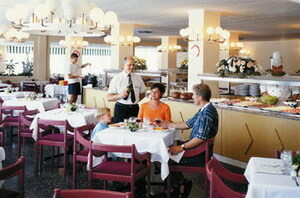 Open for breakfast, lunch and dinner, the buffet restaurant has a show cooking kitchen, children's buffet, and à la carte options at lunchtime; the hotel also hosts barbecues. 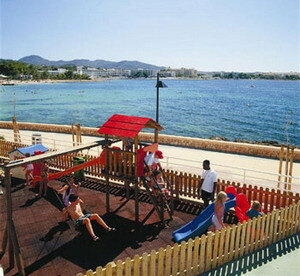 Kids are kept entertained at the mini-club, children's pool and playground. The hotel offers a full programme of activities and entertainment for both adults and children with games, sports, competitions, dancing and professional shows which include Flamenco dancing and magic shows. Practical amenities include currency exchange, laundry facilities and babysitting services. There are plenty of sporting activities on offer near the hotel with tennis courts 600 metres away, bicycle hire 500 metres away, and a variety of water sports including wind surfing, pedal boats and water skiing within one kilometre. 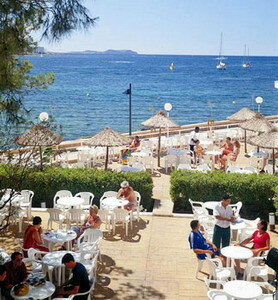 There are local shops 50 metres away and the resort centre of San Antonio is 1.5 kilometres away. 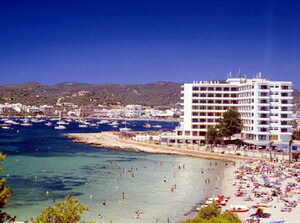 Ibiza Airport is 18 kilometres away with an approximate driving time of 20 minutes. All-inclusive Plan - The all-inclusive rate includes the following: room accommodations, buffet breakfast, lunch and dinner, à la carte lunch options, unlimited local alcoholic and non-alcoholic drinks in the bar, soft drinks, beer, wine and mineral water with meals, snacks including paella, pizza and salads, use of swimming pool and pool sun loungers, table tennis, mini- club, children's pool and playground, daily shows and entertainment. Not included: premium wines/alcohol, minibar items, billiards, local land and water sports, babysitting services, phone usage, additional purchases. This two-floor hotel features 210 air-conditioned guestrooms decorated in light hues with tiled floors, modern wood furnishings and cheerful fabrics. All include balconies, cable tv, direct-dial phones, safes and hairdryers.